The Drum Corps International World Championships went to Madison, Wisconsin for the second of three consecutive years in 1986. Had the Blue Devils beaten Santa Clara Vanguard at the very first show of the season, the Concord, California corps would have had an undefeated season on its way to the Championship title. Santa Clara would place 2nd for the second time in four years, their amazingly quick pants change in an on-field tunnel being perhaps the most anticipated effect at corps contests. The Cavaliers placed among the top three DCI corps for the first time by edging the 4th-place Garfield Cadets by a tenth of a point. 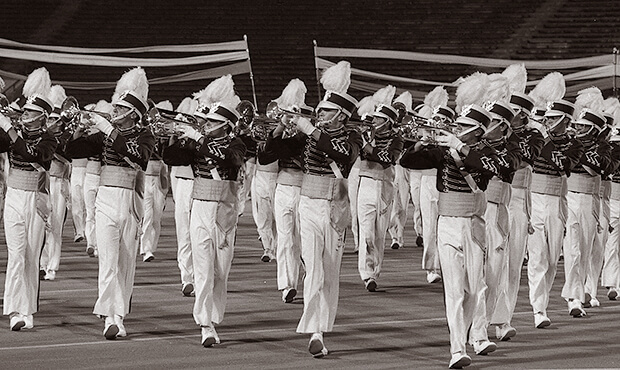 Outside of the Drum Corps International Tour, the summer of 1986 was a special one for the Garfield Cadets. The New Jersey corps interrupted its season to perform at the nationally televised celebration of the renovation of the Statue of Liberty on the occasion of the statue's 100th anniversary. This was a huge, four-day national event with multiple celebrations bringing together big-name music and media stars including President Ronald Reagan and French President François Mitterrand. The Cadets performed on national television the morning of July 4 at New Jersey's Liberty State Park, with the nearby Statue of Liberty towering behind them. Back on the football field, the bulk of the Cadets' 1986 production was music from Leonard Bernstein's film score for "On the Waterfront," the 1954 Academy Award-winning movie starring Marlon Brando and Eva Marie Saint. Although Bernstein's music appears in other films, this was his only score originally written for a film—All his other film scores started out as scores for stage productions. At a time when corps were allowed just 128 members and a typical horn line consisted of about 64, it was shocking to see the three-time defending DCI Champions come out with a massive 84-person horn line, including 28 sopranos, 18 mellophones, 26 baritones and euphoniums, and 12 contras. Even more shocking, was the beginning of the show when the corps' 12 color guard members played brass instruments, temporarily raising the number of horns to 96. Visually, the start of the show featured the corps in a giant box, which then moved forward and rotated into a parallelogram. The 12 guard members played horns and wore corps trousers, as the original concept for the show was that members would be interchangeable as both musicians and guard members. The opening strains replicated the opening French Horn solo in the movie, noted by Bernstein as "Andante (with dignity)." It recurs throughout the film and the "Symphonic Suite" that Bernstein culled from the film score. After this opening, the corps went into the rather violent "Allegro molto agitato" movement (loosely translated to "fast and extremely restless"). The entire color guard was employed carrying six black banners on one side and six pastel orange, pink and gold flags on the other. This might be interpreted as representing the contradictory characters of the two love interests. For the beginning of the "City Dreams" love theme, the guard members were placed on silvery-white flags, joined by 8 members of the horn line. In the film, Edie Doyle was not only Brando's love interest; she was the sister of a dead longshoreman that Terry Malloy, Brando's character and an ex-boxer, was tricked into helping murder. This later resulted in one of the most famous lines in movie history, as Terry proclaimed, "I could have had class, I could've been a contender." The "Presto barbaro" (fast and barbaric) movement evolved out of the love music, with the 12 members of the guard running around the field with three long banners of lime green, baby blue and deep blue. The banners boxed in various sections of featured brass players and provided a backdrop to the horns in various geometric blocks. Being somewhat ungainly, these banners gave the guard members quite a workout as they tried to keep them stable and upright in the wind. Originally, word among drum corps fans was the rest of the show was going to be Bernstein's "Prelude, Fugue and Riffs." However, that piece was put on hold until the corps' 1991 show and was replaced with "Christopher Street" from Bernstein's score to the musical, "Wonderful Town," the 1953 Broadway production that won five Tony Awards. It is far lighter fare than Bernstein's later works, such as "Candide" and "West Side Story," and in comparison, its songs are relatively obscure. During this section, the color guard members wore yellow raincoats and carried yellow flags. When they removed the raincoats, they were wearing long white skirts instead of the corps trousers, the only time during the show that their costuming appeared unique. Closing out the production, the guard members picked up 12 white plastic clarinets as props before moving to flags. The horns fell into a company front, and then marched toward the front stands while facing backfield. Some have claimed this was a humorous poke at other corps looking back instead of forward. Whether it was or not, it's certainly justified that after three straight DCI World Championship titles, this show was anything but safe in the direction it tried to propel the Cadets. For this week only, you can save on the Legacy Collection DVD that contains this complete Cadets performance, along with all finalists from the 1986 DCI World Championships. Discount DVD offer ends Monday, June 9.